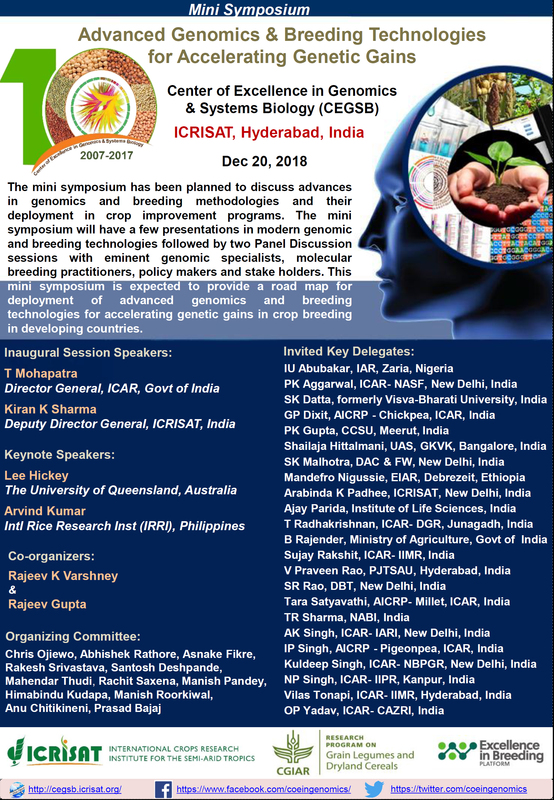 ICRISAT’s Center of Excellence in Genomics & Systems Biology (CEGSB) together with CRP-GLDC and CGIAR Excellence in Breeding (EiB) Platform is pleased to organize one day mini symposium on “Advanced Genomics & Breeding Technologies for Accelerating Genetic Gains” on December, 20, 2018 at ICRISAT, Hyderabad. The symposium has been planned to discuss advances in genomics and breeding methodologies and their deployment in crop improvement programs. It will have few presentations in modern genomic and breeding technologies followed by two panel discussions with eminent genomic specialists, molecular breeding practitioners, policy makers and stakeholders. This mini symposium is expected to provide a road map for deployment of advanced genomics and breeding technologies for accelerating genetic gains in crop breeding in developing countries. For more details and symposium flyer click here.